To quote MC Hammer, “You can’t touch this (oh-oh oh oh oh-oh-oh,,,repeat to fade)”. That perfectly sums up the event in Ardingly last Sunday. What a way to wrap up the season! Fair enough the cycle cross community opt for voluminous bobble hats instead of gratuitous balloon pants but the general atmosphere was excessive, playful and the sand section was bordering on the ridiculous and therefore had much in common with the Hammer himself. 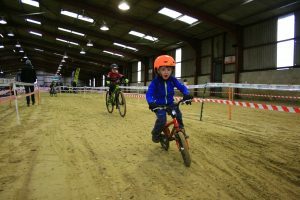 It was a long day out for many families who travelled from the wider South East area but spirits were high and the atmosphere in the shed was reminiscent of many a student party from the 1990’s – the tunes and the banter were flying. (Fair enough, children who have been subjected to a road-trip anthology or two begrudgingly acknowledged some of the less “not-so-awful” 90’s tunes as they made their way round the sandy shed section). As a parent of two girls who compete, I have come to know and befriend a very large group of similar Support Teams (that’s code for sandwich makers/ kit holders/ inner tube retrievers and general psycho-pep squads). It has been a good year, without too much rain but Sunday’s event was blessed with a nice big shed to shelter from the phantom biting wind that seemed to whip up at a moment’s notice. The laying on of a second shed with padded chairs seemed almost over-indulgent on the Crawley Wheelers’ part but I guess they knew that it wasn’t just the VET 50s who occasionally need to rest weary bones. 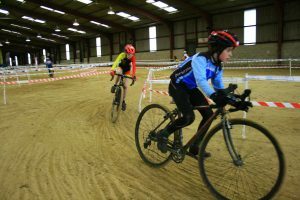 What strikes me every time about cyclo-cross events is the general sense of comradery amongst parent by-standers. 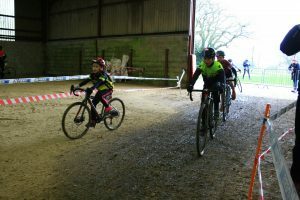 We can all remember a time when someone has jumped in to help, either when changing a tyre for an apoplectic 10 year-old just before a race or when they have helped untangle some errant tape that has got stuck in a derailleur. 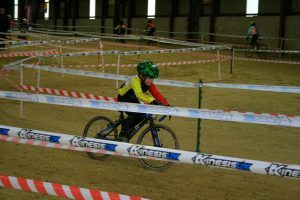 It is the cheering-on of other kids from other clubs by parents who really want their kid to do well that makes cyclo-cross special. Sunday’s event was no different. It was lovely to see parents turn and congratulate each other on their respective kid’s achievements over the season. We all keep tabs! We watch them fall. We watch them sprint. We make sandwiches. We bring a flask. We end up letting them eat cake even though we bring rice cakes. We shout out unhelpful comments about changing gears and catching the wheel in front of them. We may even say something sensible on occasion. But we also get to spend our Sundays in a field with other parents who want our kids to succeed and to get a little muddy while doing that. Parents who cross are not exactly all coming from the same starting point but we are all working towards the same things : young people who know how to find their kind of people. The Crawley Wheelers’ went to town on setting up a fantastic course with enough twists and turns to titillate and confuse both spectator and competitor alike. 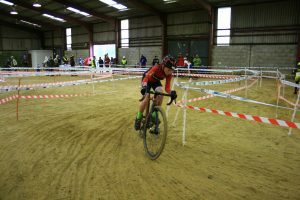 The organisation was second to none and all the volunteers and organisers need to be recognised for being part of the big, crazy family that is Cyclo-cross. Without them, parents who cross would be bored out of their tiny cotton minds at tuba recitals and sweltering to death at synchronised swimming galas. So, chapeau to the lot of you! And chapeau to the grown-ups who help all those kids give it all they got weekend in and weekend out. (Sandwiches don’t make themselves – fact!) It was a great day out. We will be talking about it for a while.